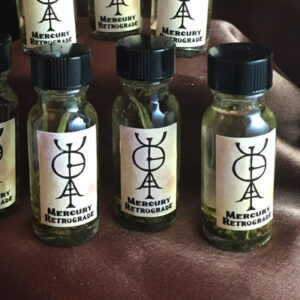 Mercury Retrograde Oil by Coastside Conjure is created for the duration of Mercury’s Retrograde progression, which happen three times a year for approximately a three week duration each time. Mercury, the astrological planet of Communication and ruling planet of those born under the Gemini and Virgo astrological signs, can cause havoc in all matters of communication and business and personal relationships. What does a Mercury Retrograde mean to you? Sometimes the other planets appear to be traveling backward through the zodiac; this is an illusion. We call this illusion retrograde motion. Three times a year, it appears as if Mercury is going backwards, when actually it is not, but it appears to be doing so. This time during Mercury’s Retrograde motion is traditionally associated with confusions, delay, and frustration. Mercury’s retrograde periods can cause our plans to go in a manner that we had not envisioned. Despite all the problems that this may appear to cause, a Mercury Retrograde time is an excellent time to reflect on the past. Intuition is high during these periods, and coincidences can be extraordinary. WHAT SHOULD I DO WHEN MERCURY IS RETROGRADE ? The planet Mercury rules communication, travel, contracts, automobiles, and such. So,when Mercury is retrograde, remain flexible, allow time for extra travel, and avoid signing contracts. Review projects and plans at these times, but wait until Mercury is direct again to make any final decisions. It has been said that using Mercury Retrograde Oil will aid and assist in interpersonal communication during this rough planetary time and will prevent miscommunication and misunderstandings. * Anoint a white 7-day glass “novena” vigil candle with Mercury Retrograde Oil and burn when typing e-mails or doing other written work for clarity in your words and to convey the correct messages. * Dab a drop on each temple when having to make a presentation or give instructions to co-workers. 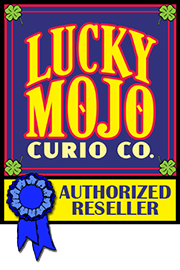 * Use to anoint your head daily during a Retrograde period so that you will be clearly understood.